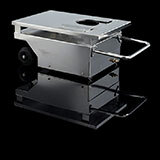 TRAINERS fire caddy is a base unit on which you can mount mock-ups to simulate different types of fires. The fire caddy is hermetically sealed to prevent water and other fire extinguishing means from reaching the electronic circuits. To protect the fire caddy from temperature shock, the mock-ups are mounted on a stainless steel plate above the unit containing the burner, valves and electronics.